Of all the animals on our planet, perhaps none are under more threat from light pollution than sea turtles. Sea turtles live in the ocean, yet they hatch at night on sandy beaches. Hatchling sea turtles have one immediate goal to ensure their future survival – find the ocean. They have evolved to locate the sea by seeing the brighter horizon over the ocean, and moving away from landward silhouettes. On a natural beach the newly hatched sea turtles find the open horizon and make for the water. Adult female sea turtles have a hard time finding an appropriately dark beach for laying their eggs and the lights of our cities confuse their hatchlings. Instead of reaching the safety of the ocean, the newborn sea turtles often head for illuminated roads, civilization, danger and death. In Florida alone, millions of hatchling sea turtles die this way every year. Light pollution has a major impact on species of endangered or threatened sea turtles that nest on developed beaches. 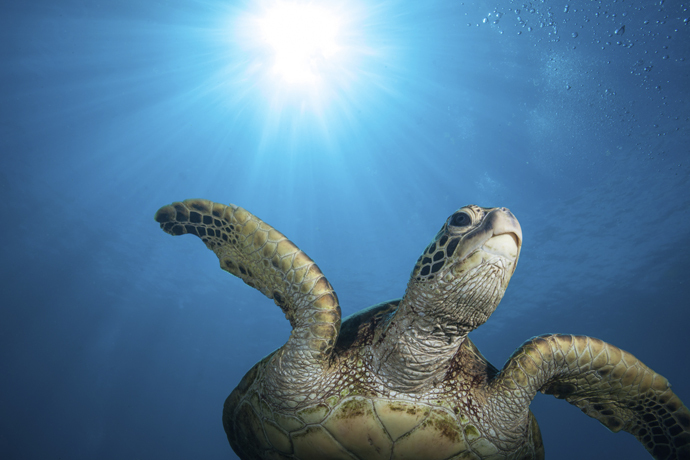 With the use of proper lighting practices, technology and awareness, IDA is making it possible for our endangered sea turtle populations to rebound. Turtle friendly light fixtures are designed to keep light where it is needed — pointed downward. And turtle-friendly light sources limit the spectrum of light emitted to minimize the impact on turtles. When used correctly, these lights provide proper illumination for human safety without negatively impacting sea turtle nesting or hatchlings’ ability to find the ocean. In 2013 the Florida Department of Environmental Protection and the Florida Fish and Wildlife Conservation Commission hired IDA to identify coastal lighting that could threaten the nesting habitats of endangered sea turtles. After spending weeks in the field, our experts developed a series of recommendations for turtle friendly lighting that are now being put into place and that will protect future generations of turtles. We’re making a difference, but there’s much work still to be done in Florida, and across the globe. IDA is looking for partners that can help us continue this work and to save our turtles.